The Shopkins Bakery Playset is the best thing since sliced bread! Your foodie characters will have lots of fun spinning in the mixing bowl or swinging in the special basket. What's more, the Bakery's a great place to keep your figures safe 'n sound after playtime. Your Shopkins playset also comes with two exclusive figures and a collector's guide to over 100 characters. Can you collect all the Shopkins gang? Connect all the Shopkins playsets together to make one large supermarket. 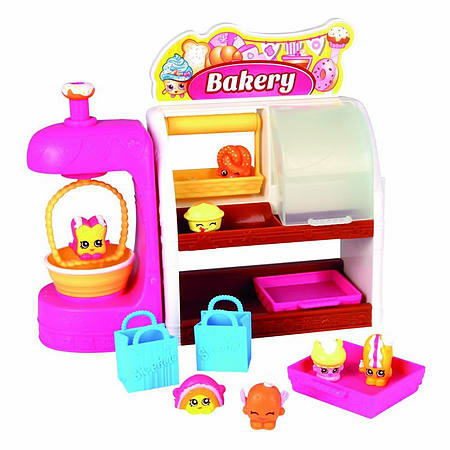 The Shopkins Bakery is ideal for shopaholics aged five years and up.